We’ll use this page for NAT changes, including EGGX/Shanwick, CZQX/Gander, BIRD/Iceland, ENOB/Bodo, LPPO/Santa Maria, and KZWY/New York Oceanic East. Here are the latest important changes for the NAT. These are also published in the latest edition of NAT Doc 007, August 2018. PBCS From March 29th 2018, PBCS is a requirement for the daily mandated PBCS NAT Tracks (right now, that the 3 core tracks each day) between FL350-390. PBCS for the NAT means having both RCP240 (4 minute comms loop) and RSP180 (3 minute position reporting). If you’re missing approval for either, then you can fly anywhere other than along the core NAT tracks FL350-390. Read more about PBCS in our article, and check out the NAT Circle of Change for an easier graphical representation. RLAT From January 4th 2018, Shanwick and Gander increase the number of RLAT tracks – most tracks between FL350-390 will now be RLAT – 25nm separation between them. And there will be more! Keep an eye on this page, we’ll keep it updated. The NAT used to be simple. Fill your flask, fire up the HF, align the INS and away you went. Now, it’s a little more complicated. Basic Instruments are not enough. Use this quick and dirty guide from FSB to figure out where you are welcome on the NAT, depending on what equipment and training you have. Valid January 31, 2018. Free for OpsGroup, or you can purchase a copy here. SLOP – Offsetting is now mandatory. Choose 0, 1, or 2nm right of track. We think 1 or 2 is best. Consider the recent A380 story. TCAS 7.1: From January 1st, 2017, TCAS 7.1 is required throughout the entire NAT region. Cruising Level: Effective 2017, you no longer need to file an ICAO standard cruising level in NAT airspace. Contingency Procedure: Published January 2017, a new turn-back (180) procedure is introduced – turn back to parallel previous track by 15nm. Datalink Mandate Exemptions: Phase 2B of the Datalink mandate started on December 7, 2017 (FL350-390). Exempt: Radar airspace, Tango Routes, airspace north of 80N, and New York OCA. Confirm Assigned Route Introduced August 2016, you will see this message when you enter NAT airspace with datalink, and you should reply with the planned route in NAT airspace. Designed to catch errors. NAT HLA The airspace formerly known as MNPS. Changed February 2016. NAT HLA = NAT High Level Airspace. Now includes Bodo Oceanic, and aircraft must be RNP 4 or RNP10. Previous MNPS approvals good through 2020. RLAT Started December 2015, spacing on the NAT Tracks reduced to “Half Track” (30nm) for 3 core tracks. RLAT=Reduced Lateral Separation Minima. Next phase (ie. all NAT Tracks 350-390) now planned for December 2017. SLOP Offsetting right of track by 1nm or 2nm became Mandatory. 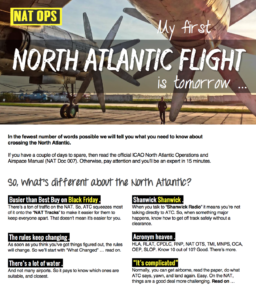 Feb 1st, 2018: FSB updated the full NAT Crossing Guide “My first North Atlantic Flight is tomorrow“.